As a beauty blogger I am privy to a lot of product launches before they hit the markets and I had the pleasure of attending the Grazia and Clarins Brunch to mark the launch of Clarins New White Plus Tri-Intensive Brightening Serum. We got an introduction to the product by the Clarins beauty experts, with an informative session on the new product’s ingredients and benefits and also an interesting product demonstration on our skin. Most Indian women are very much obsessed with achieving a fairer complexion. But I think more importantly we should aim for translucent skin that has a healthy glow 24/7. To make this skin aspiration a reality, Clarins has come up with an exceptional product which caters to all your translucent skin aspirations. 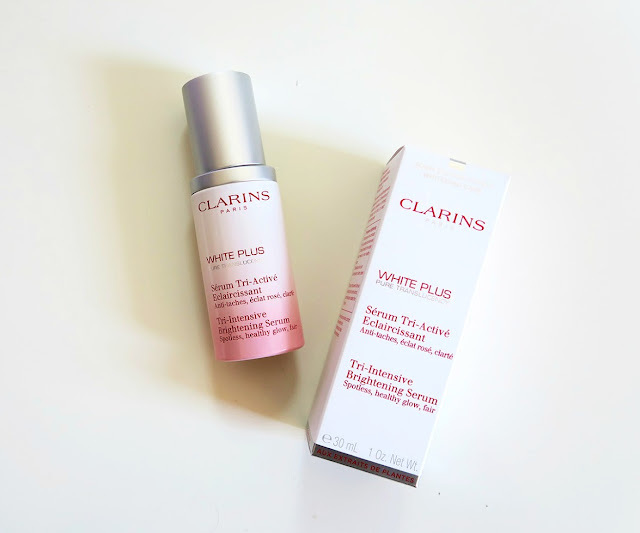 Clarins recently unveiled their all-NEW White Plus Tri Intensive Brightening Serum. With this launch,Clarins has made an major scientific breakthrough in understanding over pigmentation through the MELA-EXO-SYSTEM,with the new ‘whitening-in-control’ plant extract, Acerola, This powerful Acerola fruit extract that is best known for its amazing moisturizing, re-mineralising, antioxidant and anti-ageing benefits due to presence of high Vitamin C content in it. The active ingredient, acerola fruit, is full of Vitamin C decreases melanin production in the skin by 60%, that causes dark spots, this serum is helps you achieve whiter and brighter skin within a few weeks. Also, with the help of acerola seeds and hyrolonic acid complex, the serum will help achieve a translucency to the skin i.e spotless, healthy glow and radiant skin!The new serum acts on the three dimensions of pure translucent skin: contrast, clarity and color. I also spend my fair share in the sun, shooting for the blog and my regular beach vacations, and as a result have experienced a slight dullness of my skin and a few dark spots too. I don’t mind my arms and legs looking a little tanned, but I can’t let my face go one shade darker without feeling guilty. Perhaps because I think the skin on the face is a lot more sensitive to UV rays and more prone to wrinkles and spots. So I’m always slathering on copious amounts of sunscreen on it, as well as skin-brightening products. So after attending the Clarins launch event and listening to it’s awesome skin brightening benefits, I was really keen to try the product for myself. 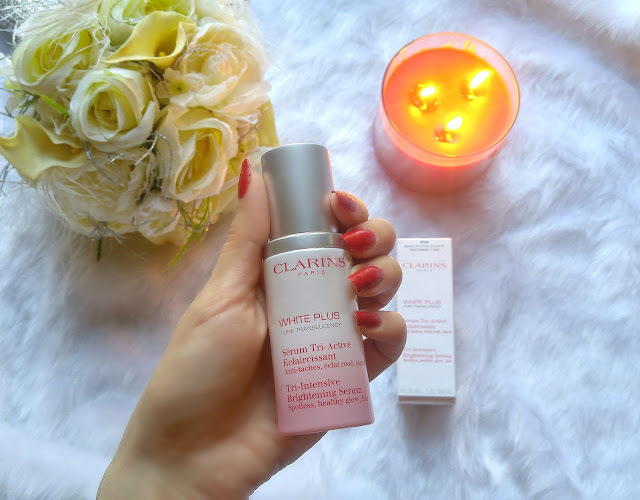 I have been using the Clarins White Plus Tri-Intensive Brightening Serum for over a month now and I have seen visible results on my skin, it has imparted a more even brighter tone and subtle glow to my skin. I love the serum’s lightweight texture and mild floral scent. With continued use, day after day, discolorations and dark spots do fade, and my skin definitely felt brighter and more radiant. All in all I’m pretty satisfied with this product.. I do believe that the active ingredient, acerola fruit, really brightened my skin, and I’m definitely not seeing any dark spots. How To Apply: Apply with light pressing motion to the face, neck and décolleté before your day or night skin care regimen. 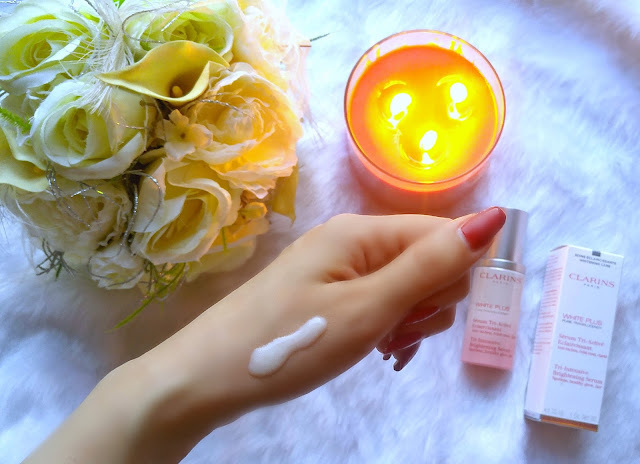 Clarins is such a well known name when it comes to skincare and the White-Plus Tri-Brightening Serum promises some really bang on quality for your money! I do think this is a great product for people who wish to achieve brighter and more translucent skin. I recommend that the NEW White Plus Tri Intensive Brightening Serum is a must have for every woman who is entering the early 30’s or older to protect that early signs of aging,who have trouble with dark spots and invigorate the lost glow. All in all, great product! The NEW White Plus Tri Intensive Brightening Serum not only corrects dark spots, unevenness and skin darkening linked to melanin overproduction but also ensures skin clarity combined with hydration and oxygenation while promoting a healthy skin glow! Take control of your skin’s translucency by taking a multi-benefit approach with the NEW White Plus Tri Intensive Brightening Serum. The new White plus Tri Intensive Serum 30ml priced at INR 4800/- is now available at Clarins outlets all across India. looks like something i would love to try! This product looks so amazing! Thanks for sharing!